Jody Bare's linocut prints: I use an original carved linoleum block, mulberry paper, magnifying glass for detailed cuts, roller or inked pad, and a padded table. I combine Jacquard textile Ink and Speedball printing ink to print my design. I have developed a type of overprinting, where I print a block twice to create contrast, plus use a combination of metallic inks with regular ink resulting in a textured effect. I brush parts of the block to alter the print. I register my prints by hand creating a loose, hand crafted appearance. Motifs are inspired from nature, ethnic, classic, or geometric figures. 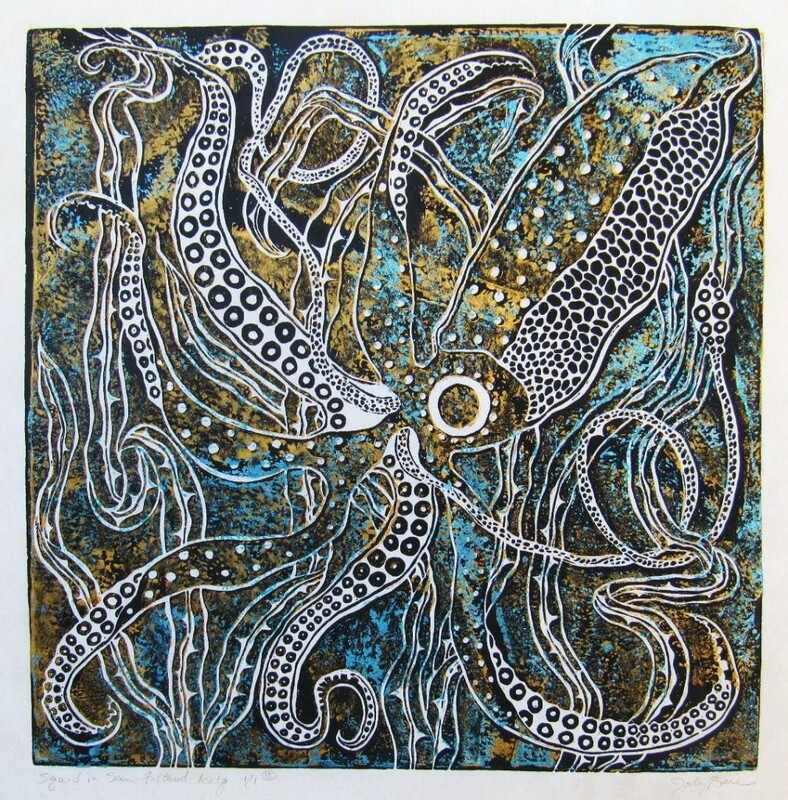 "Squid" starts out with Speedball black, rolled on; next, blue Jacquard metallic ink is padded on the block and placed exactly over the same print; turquoise printing follows; last, the metallic gold is added. The last three inking' additions are partly brushed out to create a clean detailed design. Lino-cut original print on bleached mulberry paper.